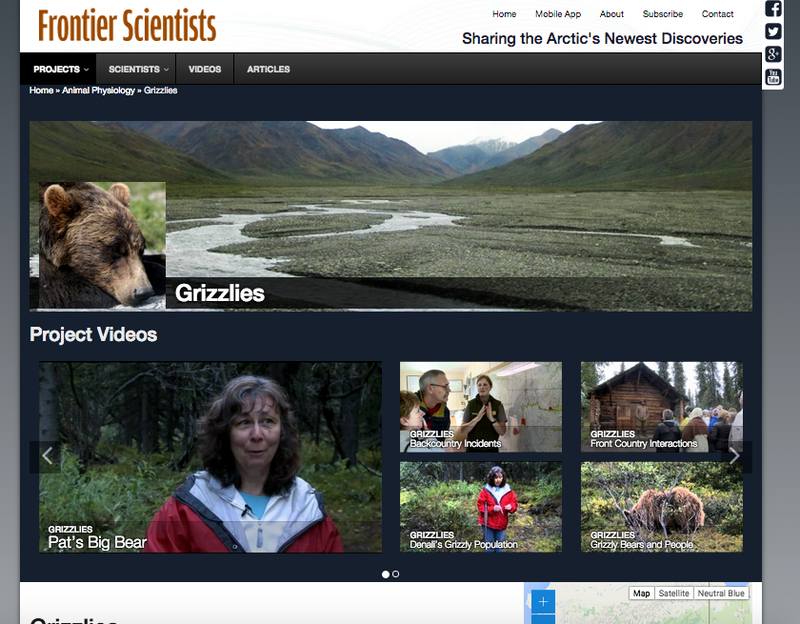 A web video resource focused on improving public science education. Alpine helped turn amazing video storytelling into an amazing website. The Frontier Scientists producers had an idea. Public exposure to science has diminished dramatically in the last 20 years, falling victim to popular cable programming and very little exposure for traditional science.Scientists needed help with their outreach programs. FS needed to have a way to push videos to YouTube and feature those stories on the web. They came to Alpine with the idea, Alpine made it a reality. Blending the short video phenomenon of YouTube along with short bursts of concise public-oriented story-telling and social media, FS has been building a following since 2011.The producers loved the presentation found on PBS video, so Alpine designed a video carousel built to support the full FS video library within the space of a typical home page slideshow.All videos are available to all Web visitors, whether they're accessing from a hotel room near a national park, a home on the coast, or even planning their vacation where the science is actually happening.The video content is organized in a series of categories or channels. For example: by scientist name, subject category (i.e. archeology, geology, anthropology etc. ); or by vodcast name (Bears, Volcanos, Climate Change).Visitors are also able to search by category or key words associated with each episode, scientist, or by science type.Each channel contains a "stack" of multiple videos. Clicking on a category takes the visitor to a video gallery where videos are displayed in multiple rows and columns as a series of thumbnails.Users are encouraged to subscribe to the FS video channel on YouTube, and share updates from the site. Schoolchildren following projects in class. Stakeholders such as public and private funding organizations. Interested "Recreational Scientists" following the pros. Certainly, a narrower audience than Mutual of Omaha's Wild Kingdom, but a critical one to help scientists reach out and communicate the importance of their work. 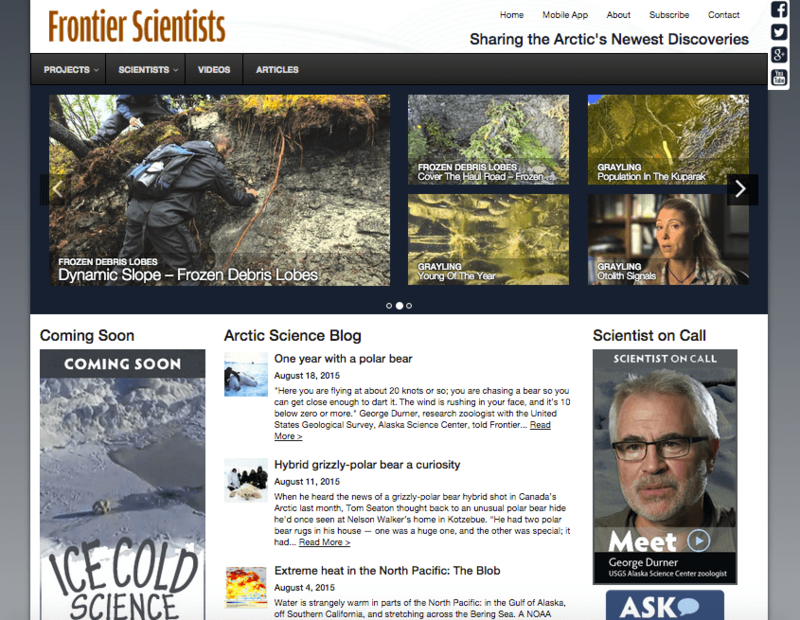 Funded in part by the National Science Foundation, University of Alaska, and Alaska Public Broadcasting, Frontier Scientists is a web video resource focused on improving public science education.Frontier Scientists puts you in the front row to observe breaking scientific news from leading Arctic scientists in Archaeology, Geology, Anthropology, the Humanities, Biology, Marine Biology, Ecology, Chemistry and more.You’ll be along when the scientists themselves are startled by the unexpected. Their Living Research Laboratories are so remote that our researchers are often the first modern visitors to set foot in these pristine locations.You’ll also see field reports on amazing natural phenomena, buried archaeological artifacts, grizzly bears, active volcanoes, and ancient Native artistry.